Originally a custom in Cantonese cuisine, dim sum is inextricably linked to the Chinese tradition of yum cha or drinking tea. Teahouses sprung up to accommodate weary travelers journeying along the famous Silk Road. Rural farmers, exhausted after long hours working in the fields, would also head to the local teahouse for an afternoon of tea and relaxing conversation. Still, it took several centuries for the culinary art of dim sum to develop. At one time it was considered inappropriate to combine tea with food: a famous third-century Imperial physician claimed this would lead to excessive weight gain. As tea's ability to aid in digestion and cleanse the palate became known, tea house proprietors began adding a variety of snacks, and the tradition of dim sum was born. In the west, dim sum came about as a natural result of 19th-century Chinese immigrants—most of whom were from the Canton region—settling on the East and West coasts. Some gourmands believe that dim sum inspired the whole idea of "brunch," the combination of breakfast and lunch into one large midmorning meal. It is true that the word brunch only came into existence in the late 1800s. Many of the dishes that compose a dim sum-inspired lunch are either steamed or deep-fried. Among the former, you'll find everything from steamed pork spareribs, char siu bao (steamed buns with roast pork), and har gaw (shrimp dumplings). Deep-fried treats include mini spring rolls and wu gok, a type of taro turnover. Finally, there's dessert. Egg custard tarts are a must; you may also have a choice between almond or mango pudding. All of these delicious foods are washed down with copious amounts of green tea. If you enjoy browsing through a menu, a restaurant that serves dim sum in the traditional style is not for you. Instead of ordering from a menu, you choose from an assortment of dishes that servers push around on carts. While it may not be evident in the hustle and bustle of the carts rolling by, there is a certain order to how dim sum is served. Lighter, steamed dishes come first, followed by exotic items such as chicken's feet, then deep-fried dishes, and finally dessert. Starting with lighter fare not only leaves room for the heavier delicacies, but also makes a lot of sense. If you were to begin dim sum with heavier deep-fried food, it would be a little like serving rice for dinner as the first course. Today, most restaurants have dispensed with the cart system. Instead, when you are first seated, the waitress will hand you a menu and you use a pencil to mark off which items you want and the number of orders. The food is still served at the table in steamer baskets to keep it warm. Restaurants that continue to use the traditional cart system—including a major restaurant chain in Hong Kong—have made this type of service a selling point. If you're looking to have a romantic lunch, a dim sum restaurant probably isn't the best choice. First off, the atmosphere is hardly conducive to romance, what with the clattering of trays, people calling out their orders, and large groups of people talking at each table. Besides, the best way to enjoy dim sum is with a group; otherwise, you'll fill up on a few items and miss the opportunity to sample everything. On the other hand, you can always take home the leftovers! For the novice, the noisy atmosphere in a dim sum restaurant can take a bit of getting used to. It's a great way to sample a variety of intriguing tastes and flavors. 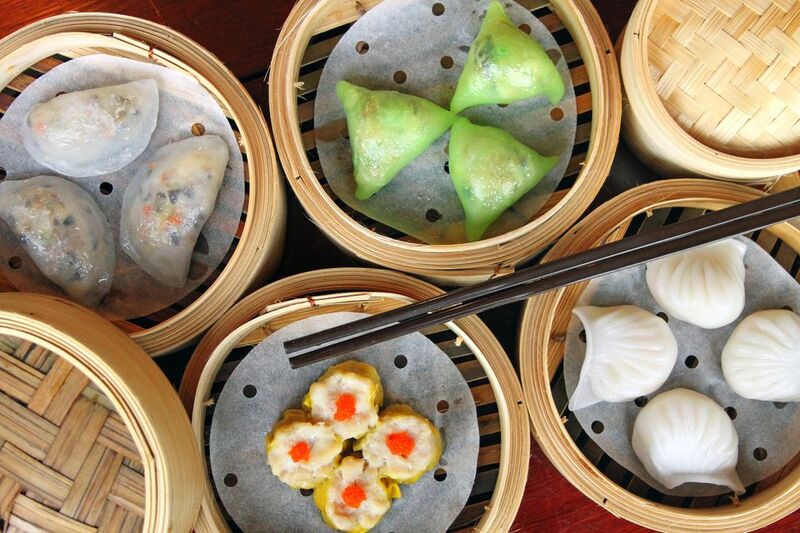 Somehow, the typical Sunday brunch can’t match the culinary appeal of Chinese dim sum. What Role Do Tomatoes Play in Chinese Cooking?